Trinity PRO technology is super-charged, offering a more powerful solution to your anti-aging needs. The Trinity PRO offers the same technology as the Trinity with super-charged, optimized output. The Trinity is designed to deliver 335 microamps at maximum intensity, whereas the Trinity PRO delivers 400 microamps at maximum intensity. 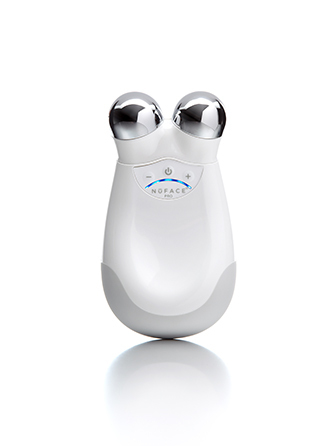 The NuFACE Trinity PRO device is compatible with the Wrinkle Reducer and Ele attachments. PREP: Cleanse skin and apply the NuFACE primer. LIFT: Glide the NuFACE Trinity Device over face as directed. FINISH: Remove the NuFACE primer with a damp cloth.